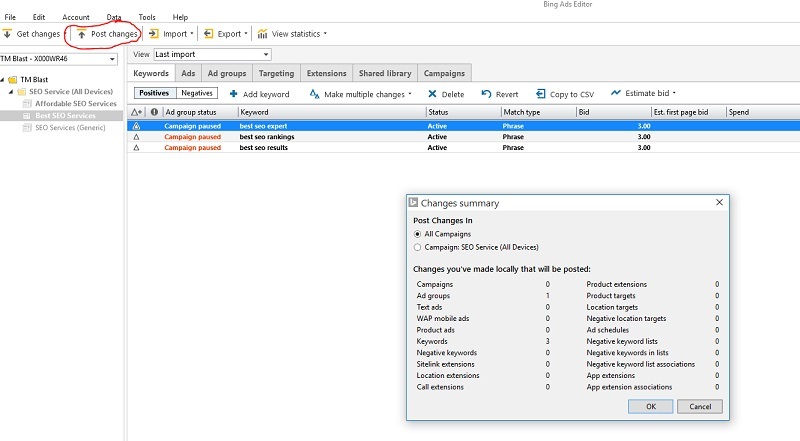 You just made all of these changes to your Bing Ads account using the Bing Ads Editor tool, but you noticed some major problems with what you did! You might of made a lot of bulk edits to your account, but now need to go back to the original file for your original campaign! You instantly cringe at the idea of having to go through a few (to a few thousand) changes in the campaign based on what you just did. 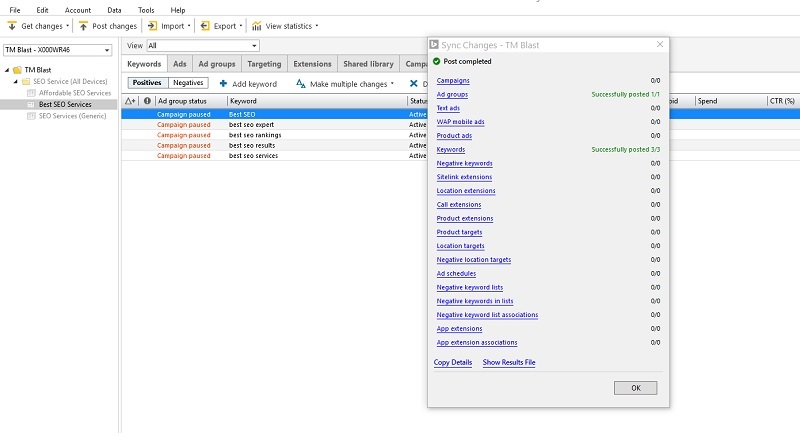 Here is where Bing Ads Editor can help revert all of those changes back for you! 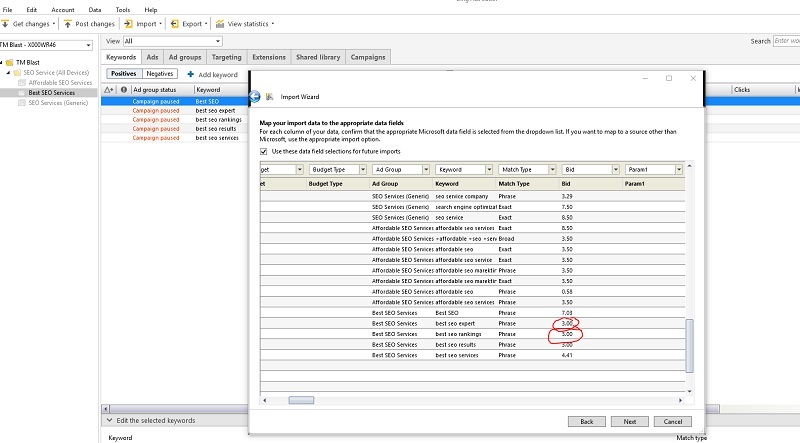 As a best practice tip, you should ALWAYS download an excel file of your campaign before you make any changes to your account in Bing Ads Editor. Even if it is to just make a few changes to your ad groups, you are better off having that file as a backup. Let’s look at an example of making a few keyword bid adjustments, but then realizing that we need to revert back the original bid. Maybe I don’t even remember what the original bid was, so this is where having that backup file becomes even more useful and clutch! Let’s say that I made a lot of changes to my account in this tool, but realized that I made a mistake! For this example, I changed the bid of these three keywords that are highlighted below. This is just a small example, but let’s say I had an account with thousands of keywords that I did this too. Maybe the original bids were all different bids, so now I will need to figure out what was there before. I can use this tool in the same way if there was one change, or thousand of changes! You can see the new bid reflected in my campaign in Bing Ads since I posted these changes from the tool. 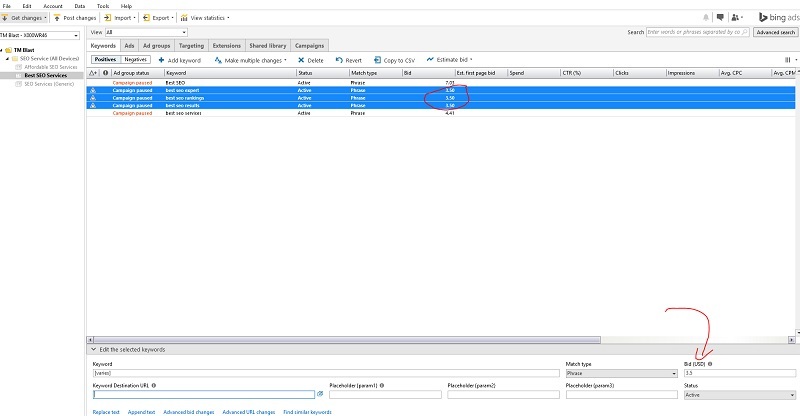 Within the tool, you will need to head to the import tab and choose From file to get this process started. From here, I am brought to this screen below. Simply browse your computer to find where you put the original file. Once the right file has been selected, you will need to head over to the next button to continue the process. With the file uploaded, Bing Ads Editor will show you what this file looks like. For this example, I want to highlight that I had a few keywords set to a bid of $3.00 before I made the changes, but after I went into Bing Ads Editor and made the first round of changes, I set the bids to $3.50. For this example, I can see that the original file had the bids set to $3.00. That is perfect because my goal is to go back to the $3.00 bid. Again, I know this is a small example, but the process works if I had three keywords or three thousand keywords. If this all looks good to you, you just need to click on the next button. You will now have this excel file in your editor tool. However, we are not done here. Post the Changes to Your Account! Just because we have the original file in this tool, we have not posted the changes to Bing Ads yet. You will notice that these three keywords are in bold and they have a triangle next to them. This simply means that these are changes that have not been posted yet to the PPC campaign. In fact, you can play around with the view section to see any changes from the last import. For this example, I just have three keywords from the original file that are different from the post changes that I made. This is good because I want to revert back to the old bids that I had before. I agree with these changes, so I am going to hit the OK button. Once all of the changes have been made, you will see a post completed box like this. From here, I can see in green what has been changed to my actual PPC campaign. And just to check in my dashboard, I can see that in fact the changes have been reflected. As a note, you will need to refresh your page to see the new changes, but they are there! The big takeaway from this experiment is to not panic if you make a mistake to your PPC account! 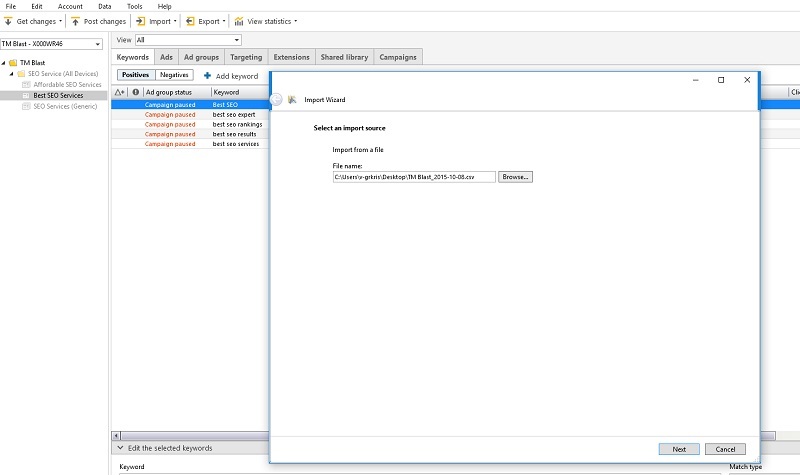 The best way to use this tool is to ALWAYS download your entire campaign into an excel file simply as a backup. 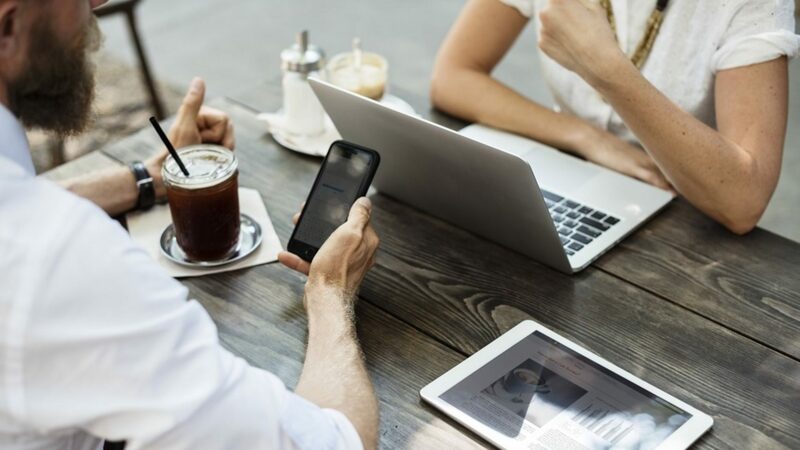 Even if it is a small change, you will want to make sure you always have a backup. With this backup, you can make simple changes (or complex changes) to your account by just re uploading the original file from before!